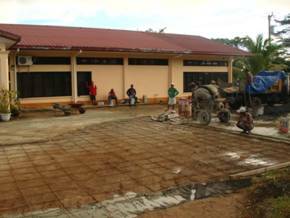 Office of the National Public Auditor (ONPA) awaits the completion of its new parking area in Palikir, Pohnpei. 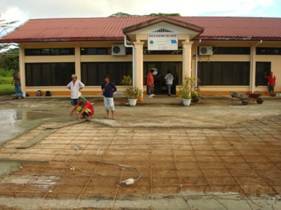 After the delayed completion of the new Compliance Investigation Division (CID) building, ONPA came up with a plan to pave its parking space and driveway not only to utilize funds retained for liquidated damage from the CID building project but also to lessen the constant flooding outside the office. Working with the FSM Department of Transportation, Communication and Infrastructure (TC&I), ONPA secured the deal with the 4TY Construction Company. According to FSM Department TC&I, the parking area project was made part of the original project to compensate for the damages resulting from the late completion of the extension building project. The project cost about $73,000.00. 4TY Construction Company began its work in September of 2007 and agreed for a 90-day to completion period. However, the project was finally completed after nearly seven months. As a result, over 13% of the total award has been retained by the National Government. In addition, once the parking construction project is completed, the National Government will release all remaining payments due for the entire two projects.